The revamped Top Gear starring Chris Evans, Matt LeBlanc, and Sabine Schmitz (for one segment only) has finally debuted. Reviews, well, they’re mixed. Our own Jared Rosenholtz has written a full review which you can check out here. But there was one part of the episode that really caught our attention, and not in a good way. During the interview segment with Jesse Eisenberg and Gordon Ramsay, the latter showed Evans a box that he just so happened to conveniently have with him under his seat. Because he’s already the owner of a LaFerrari, Ramsay was invited to spend an additional few million on the open-roof Spider version. Thing is, we already knew this was happening as far back as early March. 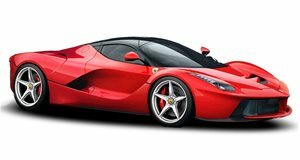 Ferrari CEO Sergio Marchionne pretty much admitted to Automobile Magazine last month that a LaFerrari Spider was on its way. Ramsay essentially confirmed on television a two month-old bit of news but Evans made it out to be "the first proof on TV, radio, or in a magazine this car exists." Not true, and that whole bit of dialogue sounded like it was staged. Just saying.